Whether you are an experienced hiker or biker or just starting out, Cumberland Valley has the perfect trail for you. The Valley is home to the midway point of the iconic Appalachian Trail. 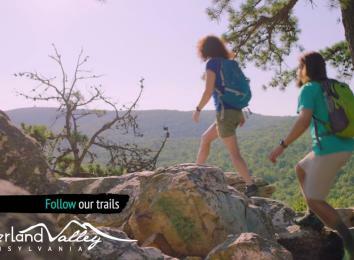 Your entire family will enjoy the unique day hikes on easily accessible trails that can be found on and around the A.T. Experienced hikers can try our more challenging trails like Pole Steeple and Flat Rock, or if you&apos;re just starting out enjoy a leisurely stroll along the Cumberland Valley Rail Trail or the Army Heritage Trail. Browse our Top 10 Hikes & Trails to get moving! Those looking to bike can experience the bike-friendly town of Carlisle or a variety of scenic, customized Bike Routes. Use the search feature below to find trail lengths, scenic vistas and more. You can also explore experiential trails and bike routes on the Official Cumberland Valley Map.